On a mysterious island, a movie crew encounters a giant gorilla who takes their leading actress and forms a special relationship with her. Because this acts as my fifth review of Peter Jackson’s 2005 version of King Kong, I’ll leave out my usual movie comments. If you’d like a longer view of the film, click on this link right here. To summarize, I like Jackson’s Kong. Despite flaws – most of which occur during the long film’s first hour – it becomes an exciting adventure. Kong isn’t Peter Jackson’s finest hour, but it achieves most of its goals. King Kong appears in an aspect ratio of approximately 2.35:1 on this Blu-ray Disc. Virtually no concerns emerged during this excellent presentation. Kong often went with a restricted, somewhat golden tone. The movie rarely featured bold colors, as it usually went with subdued hues. Even the greenery of Skull Island looked a bit pale. I didn’t regard this as a problem, though, since the disc clearly replicated the movie’s intended visuals. The colors were appropriately vivid when necessary and seemed accurately depicted. Black levels also came across well. Dark shots demonstrated good depth and clarity. Low-light shots were nicely displayed and seemed clear and adequately visible. Shadow was clean and tight. Given the darkness of so much of the film, those components became especially important, so their high quality was an important factor in the success of the transfer. Overall, the image of King Kong appeared stellar. And the audio didn’t disappoint either. At all times, the DTS-HD MA 5.1 soundtrack of King Kong worked exceedingly well. The soundfield appeared very active and involving. All five channels presented lots of material that kept the viewer at the center of a realistic and immersive world. Elements seemed appropriately placed and they blended together well. Planes and flying creatures soared from location to location accurately, and other pieces popped up in their proper places too. The whole thing meshed together quite nicely, and the piece worked swimmingly. Not surprisingly, fight sequences were the most impressive, but the entire package seemed strong. Audio quality equaled the positive nature of the soundfield. Speech was natural and distinctive, and I detected no issues connected to intelligibility or edginess. Music sounded bright and vibrant, as the score presented rich and full tones. Effects came across as accurate and concise. No problems with distortion appeared, and these elements were clean and broad. Early returns indicated that the soundtrack might be a “sub killer”, a mix with bass so overwhelming that it could decimate subwoofers. I didn’t see that as the case, though. Was the low-end loud? Without question. Was it overcooked and too heavy? Not in the least. The mix featured clean, concise bass at all times, so the low-end was smooth and extremely effective. At no point did it threaten to dominate the audio, as the bass fit in with the rest of the track well. All of this combined to make the soundtrack of Kong a complete winner. How did this 2017 “Ultimate Edition” Blu-ray compare to the original 2009 BD? Both were identical – literally, as the 2017 version just reissued the 2009 disc. The 2017 BD improves on the 2009 disc’s extras, as it offers many more materials. On Disc One, the Blu-ray provides both the theatrical version (3:07:22) and an extended cut (3:20:07). I tried to discern the additions and noticed more than a few as I watched the extended cut. Happily, the disc offers annotations in its chapter menus that tell us which scenes are new or lengthened. That helped confirm my observations and simplify the process. The most significant changes come during the film’s second act. On Skull Island, we get two new action sequences. There’s a “Ceratops Attack” that takes place right after the guys arrive to find Ann. We also get “The Swamp Journey”, a fight with sea creatures a little later in the flick. Both are fun to see, though I don’t know how well they fit in the final film. While they’re exciting and entertaining on their own, the movie includes so many similar scenes that it runs the risk of making the viewer shout “enough already”. However, that’s not a strong sentiment on my part. I like these two scenes and think they fail to harm the film. Do they make it better? Probably not, but they’re enjoyable. Late in the film, we hear a soldier sent to kill Kong as he rants about how New York is for people, not “lice-ridden” apes. This scene is moderately comic but not particularly interesting. It’s somewhat jarring, in fact, due to the soldier’s crassness. That segment probably should have stayed on the cutting room floor. At the end of the “Insect Pit”, we see a new bit on Skull Island in which Denham starts to lose it. He rambles about how when your life flashes before your eyes, “if you’ve lived as a true American, you get to watch it all in color.” This is one of those neutral segments; it’s vaguely interesting but not memorable. We also get a short snippet called “Encountering the Moa Bird” in which Lumpy’s itchy trigger finger leads to the death of an ostrich-like creature on Skull Island. Kong’s capture goes longer, and in New York, we watch more of Kong’s rampage and his chase of Jack. Neither of these additions seems particularly significant to me. The “Extended Edition” adds 13 minutes but continues to function in the same manner as the theatrical cut. It integrates the new footage seamlessly and makes all of the bits feel natural. I don’t think the “Extended Edition” improves on the theatrical cut, but it doesn’t come off as any worse, so it provides an interesting option. Along with the film’s extended cut, we get an audio commentary from director Peter Jackson and co-writer Philippa Boyens. Both sit together for this running, screen-specific discussion. At the start, Jackson notes that he wants to avoid covering the same subjects addressed in the DVD’s documentary, so I worried he might stick with minutiae. I needn’t have worried, however, as the pair touch on a nice mix of subjects. Jackson and Boyens discuss sets and production design, story issues and development, musical choices, issues with the shooting schedule, various historical references and influences, cast and characters, visual elements like costumes, wigs and color design, effects, adaptation concerns and sequences added for the “Extended Edition”, and various trivia about the flick. Jackson and Boyens offered nice chats for the three Rings flicks, and that trend continues here. They give us good information from start to finish of King as they make sure they stay focused on the appropriate subjects. There’s little chaff on display during this meaty, informative and entertaining discussion. In addition, the disc gives us U-Control, an interactive feature. It provides two separate functions. An “Art Gallery” occasionally presents concept art– and I do mean occasionally. The first images don’t show up until around the 24-minute mark, and we only find “Art Gallery” segments 10 more times. This adds up to a handful of sketches and that’s it. “U-Control” also offers a “Picture-in-Picture” feature. This gives us quick video segments that pop up periodically. These include shots from the set and comments from Jackson, set dresser Gill West-Walker, props buyer Phred Palmer, supervising art director Dan Hennah, director of VFX photography Alex Funke, pre-production CG supervisor Matt Aiken, prop maker Tony Drawbridge, Weta Workshop design and effects supervisor Richard Taylor, VFX on set supervisor Brian Van’t Hul, senior SPFX technician Geoff Curtis, mo-cap technician John Curtis, 2nd unit director Randy Cook, production designer Grant Major, Weta animation director Christian Rivers, Weta motion editors Ileana Stravoskiadi and CJ Markham, Weta mo-cap supervisor Dejan Moncilovic, Weta lead creature TD Rudy Grossman, animation director Eric Leighton, previsualization department Richard Moore, Weta senior animator Stephen Buckley, movie memorabilia collector/extra Bob Burns and wife Kathy, 2nd 2nd AD Skot Thomas, stunt double Min Windle, and actors Adrien Brody, Naomi Watts, Jack Black, and Andy Serkis. These are essentially “production diaries”, as they show us elements from behind the scenes. They cover subjects like sets, stunts, effects, props, performances, and other topics. Though they pop up less frequently than I’d like – and the disc makes it a minor chore to access them without watching the movie – they do contribute a fair amount of information, so they’re worth a look. This 2017 Blu-ray adds a second disc of extras, all of which appeared on prior DVD editions but are new to BD. Two 2006 Introductions gives us six minutes, two seconds of comments from Peter Jackson. He discusses what we’ll find within the set’s supplements. These aren’t useful but I guess they’re good to have for archival reasons. A documentary called Recreating the Eighth Wonder: Making King Kong runs three hours, four minutes and 57 seconds. No, that’s not a typo – this program really does last almost as long as the movie’s Extended Edition! During “Wonder”, we hear from Jackson, Boyens, animation director Christian Rivers, pre-production CG supervisor Matt Aitken, digital destruction supervisor Gray Horsfield, Weta creature designers/sculptors Christian Pearce, Greg Broadmore, Jamie Beswarick and Daniel Falconer, special makeup – creatures and miniatures artist Richard Taylor, Weta senior creature designer/sculptor Ben Wootten, conceptual artist Alan Lee, producer/first AD Carolynne Cunningham, visual effects DP Alex Funke, conceptual designers Gus Hunter and Jeremy Bennett, supervising art director Dan Hennah, production designer Grant Major, special makeup effects supervisor and creature effects art director Gino Acevedo, senior visual effects supervisor Joe Letteri, animation sequence leads David Clayton and Richard Frances-Moore, motion capture manager/first AD Lisa Wildermoth, miniatures model technician Shelley Stewart, miniatures supervisor John Baster, editor Jamie Selkirk, art director Simon Bright, supervising set dresser Tanea Chapman, visual effects supervisor Ben Snow, 3D CG supervisor Christopher Jon Horvath, special effects technician Darian Lumsden, Weta Digital art director Michael Pangrazio, Skull Island costume supervisor Gareth McGhie, extras casting coordinator Miranda Rivers, Skull Islanders’ on set coordinator Jamie Wilson, animation director Eric Leighton, creatures supervisor Dana Peters, digital effects supervisors Dan Lemmon, Guy Williams and Eric Saindon, 2nd unit director Randall William Cook, co-producer/visual effects producer Eileen Moran, 3D CG supervisor R. Christopher White, cameo guests Rick Porras, Jim Dietz, Frank Darabont and Rick Baker, special projects supervisor Mark Sagar, sound designer Brent Burge, ADR editor/mixer Chris Ward and actors Naomi Watts, Jack Black, Andy Serkis, Colin Hanks, Thomas Kretschmann, Kyle Chandler, Lobo Chan, Jamie Bell, John Sumner, Evan Parke, and Adrien Brody. “Wonder” opens with a look at the original 1933 Kong. Jackson discusses his love for the flick and its influence on him. From there we move through the aborted development of Jackson’s 1996 Kong and its elements. Once that journey ends, we hear reflections on how Lord of the Rings abetted a reborn attempt at Kong. That takes us to pre-production and its elements. This area follows research at the Empire State Building and with Fay Wray, conceptual design and pre-visualization, miniatures and sets, actors’ training, the read-through and script complications. When we shift to the shoot, we learn about the design and creation of the Venture, set design and decoration, and various visual effects. Issues connected to Skull Island fill a lot of time, as these parts delve into the location’s look and execution. These parts include elements for the Skull Island natives as well as effects and sets. Of course, we learn a lot about the other Skull Island natives: the dinosaurs, “Wonder” digs into their visual design as well as how the film put them on screen. This leads to the methods used to recreate – and then destroy - New York circa 1933 and view all the techniques involved. After that, we find get to the King and cover the methods behind the creation of Kong. This goes through design and execution, with good footage of Serkis’s research and performance as well as attempts to make a fake ape interact with real people. Bar none, “Wonder” now goes down as one of the all-time great DVD documentaries. It delves into many nooks and crannies of the production and does so in a wonderfully involving and entertaining manner. From the start, it draws in the viewer with great footage of Jackson’s childhood Kong puppet and early stop-motion animation. Scads of terrific material from the set appears, and we even get to look at footage the actors shot with the old Bell & Howell featured in the flick. The documentary’s three hours fly by as this adds up to a simply stunning program. Next we get Production Diaries. Originally available as a separate DVD package, this area presents 54 short video pieces that run a total of three hours, 50 minutes, 18 seconds. If you click the link above, you’ll get a full review with all the details on the “Diaries”, so I won’t duplicate that material here. Suffice it to say that the “Diaries” offer a great collection of clips that give us a fine look at the movie’s day-to-day creation. We also get an introduction from Peter Jackson that led into the original 2005 “Diaries” DVD set. It goes for five minutes, 34 seconds and brings us another decent lead-in. Next we find Post-Production Diaries that last a total of two hours, 32 minutes, 347 seconds. These pick up where the earlier “Diaries” ended and cover the post-production process. The “Diaries” themselves feature lots of footage from the production along with comments from participants. We find remarks from Jackson and actors Andy Serkis, Jamie Bell, Jack Black, Adrien Brody, Jed Brophy, Matt Chamberlain, Lee Hartley, Evan Parke, Thomas Kretschmann, Lorraine Ashbourne, and Colin Hanks. We get more statements from editor Jamie Selkirk, Avid editor Jabez Olssen, associate producer Annette Wullems, Weta animation director Eric Leighton, Weta design and effects supervisor Richard Taylor, director VFX photography Alex Funke, mo-cap department manager/AD Lisa Wildermoth, supervising sound editor Mike Hopkins, supervising sound editor/sound designer Ethan Van der Ryn, mo-cap technician John Curtis, ADR editor/mixer Chris Ward, sound designers Brent Burge and Dave Whitehead, sound FX editors Melanie Graham and Justin Webster, and first assistant sound editor Martin Kwok. As the “Diaries” progress, we also find first assistant editor Dave Birrell, VFX editor Matt Villa, second assistant editor Mark Hawthorne, miniatures unit production manager Belindalee Hope, motion control operator Gerald Thompson, Weta miniatures supervisor John Baster, Weta miniatures technicians Daniel Bennett and Ian Ruxton, urethane technician Duncan Brown, Weta senior animator Stephen Buckley, Weta senior visual effects supervisor Joe Letteri, co-producer Eileen Moran, Weta camera supervisor Lee Bramwell, Weta animators Kenneth Roy and Victor Huang, Weta Digital compositing supervisors Charles Tait and Mark Lewis, Weta Digital modeler James Ogle, Weta pre-production department manager Fiona Foster, Weta creature supervisor Dana Peters, Weta pre-production CG supervisor Matt Aitken, trailer editor Steve Harris, Weta Digital FX supervisor Eric Saindon, Weta Digital producer Cyndi Ochs, Universal Pictures Marketing co-president Eddie Egan, and Universal Pictures vice-chairman Marc Shmuger. As we continue, we see sound effects editor Katy Wood, key 2nd AD Marc Ashton, Weta compisiting sequence lead Frank Ruter, Weta Digital compositing supervisor Erik Winquist, SPFX supervisor Steve Ingram, post production runner James Meikle, production runner Jamie Lawrence, art department manager Chris Hennah, supervising art director Dan Hennah, production manager Brigitte Yorke, rigging electronics Gus Salla, unit production manager Anne Bruning, on-set unit assistant Missy Rika, construction foreman Derek Misseldine, lighting storeman Chris Palmer, gaffer Reg Garside, key standby costume Emma Harre, stunt performer Shane Rangi, NZ makeup and hair supervisor Rick Findlater, stand-ins Julia Walsh and Cori Gonzalez-Macuer, producer/1st AD Carolynne Cunningham, 2nd 2nd AD Skot Thomas, and script supervisor Victoria Sullivan. The roster doesn’t end there! The “Diaries” continue with lighting technician Reuben Morrison, stills photographer Pierre Vinet, 3rd AD Zo Hartley, digital assist assistant Zeb Simpson, digital assist operator Luis Olivares, director of photography Andrew Lesnie, health and safety coordinator Andy Buckley, co-producer/screenwriter Philippa Boyens, HOD model technician Paul Van Ommen, greensperson Lucy Woolhouse, model technicians Fraser Wilkinson and Nicole Cosgrove, model maker Kate Wyatt, Weta lead roto artists George Oliver Jr., Peter Demarest, and John-Michael Bills, Weta paint and roto supervisors Quentin Hema and Sandy Houston, foley supervisor John Simpson, foley artist Carolyn McLaughlin, foley recordist Robyn McFarlane, Weta senior photographer Matt Mueller, and Weta 3D lighting lead Jean-Colas Prunier. The hits keep coming with Weta lead texture painter Mel James, Weta creature TD Eric Petey, scan/record supervisor Nick Booth, supervising digital colorist David Cole, Weta special projects supervisor Mark Sagar, Weta animation director Christian Rivers, Wet mo-cap supervisor Dejan Momcilovic, Weta motion editors Ileana Stravoskiadi and CJ Markham, Weta lead creature TD Rudy Grossman, animator sequence leads David Clayton and Richard Francis Moore, Weta animators Kenneth Roy and Jeremy Bolan, 2nd unit DP Richard Bluck, VFX on-set supervisor Brian Van’t Hul, miniatures unit gaffer Rob Kerr, film historian/collector Bob Burns and wife Kathy, sound FX mixer Chris Boyes. For the final lap, we hear from music mixer Michael Hedges, dialogue mixer Michael Semanick, pre-dub mixer Tom Johnson, composer James Newton Howard, technical music coordinator Chris Bacon, orchestra conductors Peter Anthony and Mike Nowak, supervising orchestrator Jeff Atmajian, scoring crew Adam Michalak and Greg Loskorn, score co-producer James T. Hill, music consultant Stuart Thomas, supervising music editor Jim Weidman, music coordinator Nigel Scott, Universal Pictures Film Scoring Feature Music director Tiffany Jones, score mixer Alan Meyerson, lab liaison Andy Wickens, Weta visual effects supervisors George Murphy and Ben Snow, Universal Pictures Senior Vice-President Post-Production Greig McRitchie, Universal Pictures Editorial Picture and Sound Support Jonathan Phillips, Universal Pictures International Publicity Mark Markline, Universal Pictures Senior VPs of Special Projects Hollace Davids and Linda Pace Alexander, and Jhada of NY event coordinator Patricia Michaels. In these “Diaries”, we observe a mix of subjects. These cover miniatures and their photography, Kong performance capture, recording sound effects, sound design and the mix, various editing concerns, digital visual effects and all those elements, and the creation of the teaser trailer. From there we fly through second unit and pick-up photography and their many complications, ADR and foley, color grading, creating Kong and the other creatures, and the film’s score. The “Diaries” end with an overview of wrapping up the various projects, publicity junkets, and premieres. There’s very little about which to complain here. The level of detail is strong, as these “Diaries” cover so much of the work done for Kong. They make sure we understand the details and often ignored aspects of filmmaking. Those prove quite illuminating as we learn a lot of neat tidbits about the flick’s creation. Some may see this as overkill, but I think the “Diaries” offer much charm and vivacity. They take potentially dry information and present it in a fun, entertaining way. These are very enjoyable and illuminating. 16 Deleted Scenes fill a total of 37 minutes, 41 seconds. We can watch these with or without optional introductions from Jackson; if you include those, the running time adds up to 44:27. Note that some of these didn’t make it through the final processes, so expect some rough visuals at times. Most look pretty good, but you’ll occasionally see green or blue screens and crude computer effects. We also see quite a few alternate or lengthened sequences, including a clip that actually shows a hint of a conscience from Denham, a factor lacking in the final flick. One scene I’m happy to see: the alternative first exposure to Kong’s presence. This segment appeared in the movie’s trailer, so it’s great to find out why it didn’t end up in the eventual release. Don’t expect much additional action, though a few pieces appear. There’s a slight extension to the bronto stampede, and there’s cut material with Kong and Jack in New York. We also find more of the Army’s pursuit of Kong through Manhattan. All in all, the deleted scenes prove quite interesting. I don’t know if any of them should have made the final movie, though I’d probably argue for the inclusion of “Kong Versus the Army”. In any case, they’re fun to watch. Jackson’s introductions prove uniformly useful. He gives us production basics but devotes most of his time to explanations of why the clips didn’t make the movie. We get plenty of good information in these efficient chats. Entitled The Eighth Blunder of the World, a “blooper reel” runs 18 minutes, 51 seconds. That’s a lot of goofs, and most of them fall into the usual category of mess-ups and goofiness. However, even though I usually don’t care for these reels, this one has some good moments. The cast jokes around a lot and gives us some funny bits. Heck, we even get to see a quick glimpse of what it’d be like if Jedi took on dinosaurs! This is one of the better gag reels I’ve seen. Next we discover The Making of a Shot: The T-Rex Fight. The 16-minute, 29-second clip exists as a “bonus production diary” that also runs during the main program, though it’s considerably more specific than the others. It includes comments from Jackson, Bennett, Rivers, Selkirk, Olssen, Funke, Moran, Weta visual effects supervisor Joe Letteri, and Weta special makeup effects supervisor Gino Acevedo, Weta pre-production R&D supervisor Matt Aitken, Weta lead animator David Clayton, Weta 2D sequence supervisor Erik Winquist, and supervising sound editor Ethan Van der Ryn. While the body of the “Production Diaries” do little to potentially spoil Kong, “Fight” is a different beast altogether. It gives us an idea of what we would see in that sequence and goes through all the elements used to create it. We also get to watch the final product, at least for a few seconds of the overall battle. It’s not a terrible spoiler, though, and objectively, it’s a good little featurette that covers the scene well. Kong’s New York runs for 28 minutes, 26 seconds. We hear from director/writer/producer Peter Jackson, writer/co-producer Philippa Boyens, authors Daniel Okrent, Mike Wallace and James Sanders, history professors Josh Freeman and Robert Snyder, production designer Grant Major, supervising art director/set decorator Dan Hennah, Skyscraper Museum director Carol Willis, Weta Digital senior visual effects supervisor Joe Letteri, and actors Naomi Watts and Jack Black. “New York” looks at the history of the Great Depression and its impact on the city. We also learn about elements connected to the film such as vaudeville and other forms of entertainment, New York Harbor, transportation, Prohibition, skyscrapers and the Empire State Building. This show acts as a nice backdrop for the movie’s events. 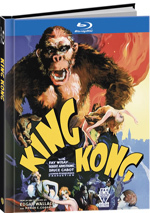 It allows us to better understand the world Kong depicts and it offers a tight little history of the involved elements. It’d be a good piece to watch before you take in the movie. After this we get the 17-minute, three-second Skull Island: A Natural History. Unlike the fact-based “New York”, “Island” offers fake history, as it tells us about the movie’s fictional island. “Island” includes comments from Jackson, Hennah, Major, Boyens, creature designer Daniel Falconer, senior creature designer Ben Wootten, conceptual artist Alan Lee, creature designer Christian Pearce, special makeup effects supervisor Gino Acevedo, creature designer Greg Broadmore, special makeup, creatures and miniatures creator Richard Taylor, and conceptual designer Jeremy Bennett. View “Island” as a fanciful way to examine the location and creatures and ignore the goofy attempts to pass all this off as reality. We get a nice view of the various elements found on Skull Island, though unlike “New York”, I wouldn’t endorse a screening of this show prior to a viewing of the movie, as it spoils too many surprises. It’s silly at times but it’s informative in the way it fleshes out our understanding of movie elements. A Night in Vaudeville lasts 12 minutes, five seconds, as it gives us a closer look at the acts that appear during the vaudeville montage at the film’s start. We see longer film clips along with auditions and rehearsals. It ends up as a good little look at these quirky talents. A King Kong Homage goes for nine minutes, 54 seconds. It mixes clips from the 1933 King and this one as it lets us see the many references in Jackson’s version. This turns out to be a fun and useful program made better by the occasional split-screen comparisons between the two flicks. Next we find four Pre-Visualization Animatics. These come for “Arrival at Skull Island” (4:20), “Bronto Stampede” (6:34), “T-Rex Fight” (9:52) and “Empire State Building Battle” (9:29). Each of these allows us to see the original computer-generated pre-viz sequences. We can watch them with or without music, though they all come with effects and dialogue. They’re very fun to inspect, especially in the case of “Battle”, since it also includes an option to compare the animatics to the final film. We follow with some Conceptual Design Video Galleries. These break into five subdomains: “The 1996 King Kong” (9:53), “The Venture” (4:06), “Skull Island” (15:38), “New York” (4:34) and “Kong” (7:11). That’s a total of 41 minutes, 24 seconds of material. Each of these shows tons of art and other elements created for the movie. The 1996 pieces again stand as the most interesting since they show ideas not used in the 2005 edition, but all of these give us a fine look at the movie’s visual development. I must say I’m not wild about the video format, however. Most of the components would work better in the traditional still frame approach, especially if we want to rewatch them. With this method, it becomes awkward to find what we desire. rom there we watch the flick, a cute feature created for Jackson’s birthday. This offers a great little addition to the set. Trailers offers three promos. We get the teaser and theatrical ads for Kong along with a “Cinemedia Trailer”. That two-minute, 42-second clip provides comments from Jackson, actors Naomi Watts, Jack Black, Jamie Bell and Adrien Brody. They tout the flick in this brief infomercial. More promotional material comes to us in the Weta Collectibles clip. This five-minute, 17-second piece features notes from Jackson and Weta Workshop’s Richard Taylor as they discuss the retail sculptures created for fans to buy. Though essentially an ad, this provides a decent look at how these were made. A third disc provides a DVD copy of Kong. It duplicates the original theatrical cut release from 2006. Peter Jackson’s King Kong seems destined to be perceived as a disappointment in many ways, but I don’t think it deserves such a fate. Though the movie sags during its first act, the excitement and thrills of the subsequent two hours make up for its flaws. The Blu-ray offers excellent picture and audio as well as an insane collection of supplements. 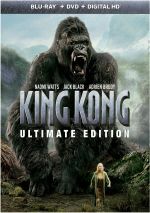 This “Ultimate Edition” may not offer anything new, but it collects everything Kong in one place for a bargain price – that makes it a tremendous value.